Welcome New Silverlight MVPs for October 2010 | | Silverlight is dead. Long live Silverlight! NuPack is a free open source package manager that makes it easy for you to find, install, and use .NET libraries in your projects. It works with all .NET project types (including, but not limited to, both ASP.NET Web Forms and ASP.NET MVC). NuPack enables developers who maintain open source projects (for example, projects like Moq, NHibernate, Ninject, StructureMap, NUnit, Windsor, RhinoMocks, Elmah, etc) to package up their libraries and register them with an online gallery/catalog that is searchable. It’s a pretty cool mechanism for getting .NET libraries. For other open source developers this concept isn’t something new (i.e., gems). But for .NET developers it might be because it is a difference from the way we typically have received dependent and 3rd party assemblies for our projects. It provides a PowerShell script mechanism for adding packages as well as the well-known “Add Reference” gesture for VS developers. All the initial information around NuPack has been from folks like Scott Guthrie, Phil Haack, David Ebbo, etc. You might recognize these names from the ASP.NET world. In fact if you do your first “list-package” command you’ll see a lot of ASP.NET-related packages. If you didn’t know any better and weren’t an ASP.NET developer you might ignore this. However, NuPack is for everyone! 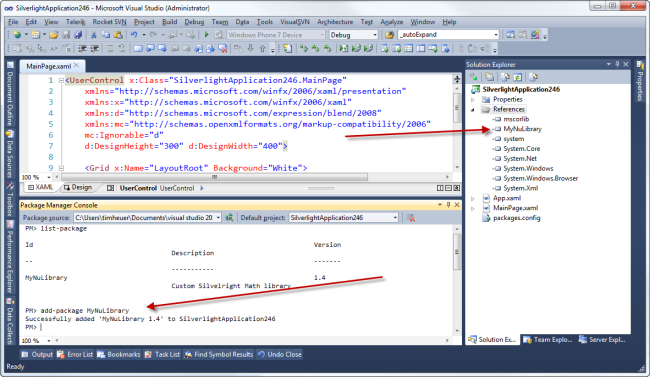 One of the most commonly installed items for Silverlight developers after the toolset is the Silverlight Toolkit. It is a plethora of controls that frankly you probably can’t live without (at least one of them) if you are developing a broad Silverlight application. After spending a few minutes reading on NuPack I decided to explore. I first just wanted to play around and created a Silverlight class library MyNuLibrary. It has one class Math that just has two functions. The contents is pretty much irrelevant here. I wanted to create a package for this and test it out. You can see that the <files/> node tells the package where to put things. Notice the lib\SL4 target attribute value. This tells NuPack (and installers of the package) that this library is really targeting Silverlight 4 (uses TargetFramework value of the source project when installing the package to verify). There is more information on the NuPack project site about this. for my needs. I’ve communicated the issue to some folks on the NuPack core team and I think there may be some changes (I haven’t submitted a patch yet until I understand the need for the original code path). And yes, I realize my change above effectively makes the if…else do the same thing and thus the if…else isn’t needed. Again, I’m awaiting confirmation of the valid scenarios before submitting what I think the patch should be. And upon build I now have a MyNuLibrary.1.4.nupkg file as an artifact of my build. Done! If we look at the contents (it’s actually just a OPC ZIP file we can see the structure and you’ll notice that our binary is in the lib\SL4 folder. Now I can consume it. And I’m done. Pretty cool. Any updates I (as the library author) would just update my .nuspec file to the new version, generate a new package, and publish it again. 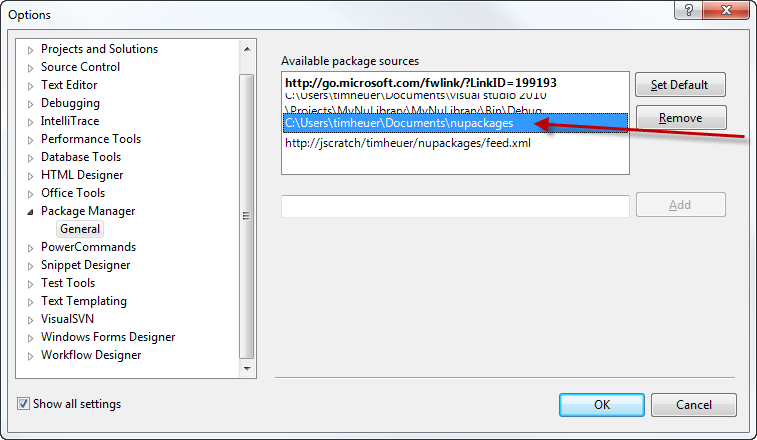 The app developer can initiate update-package MyNuLibrary and get the updated bits. Since the source code is available for the toolkit I just used that base (hence the “Binaries”) folder name in the manifest. Awesome huh? Now I could (and probably should have) actually made these independent packages so you could only get the Visualizations if you didn’t need anything else…and then could use the dependency feature of NuPack if needed. Notice how I also did the Silverlight for Windows Phone Toolkit as well and that it automatically added the Icons for the ApplicationBar in my project as well. That was due to a helpful tip from Phil about naming conventions in the package. I think NuPack is pretty cool Yes, flame away that it is nothing new conceptually. That’s fine. However the interation into the tool I use most is great and that I don’t have to go to a different console window and then back and forth. That level of integration is pretty slick. Will the Silverlight Toolkit(s) be deployed like this? Who knows, right now it is just an experiment. But it was pretty cool to see it all working as expected. I think for an alpha view of the process it’s pretty good. Oh and if you want IntelliSense on the nuspec file, they’ve published the schema so you can put that in a text file (nuspec.xsd) and place it in your %ProgramFiles%\Microsoft Visual Studio 10.0\Xml\Schemas directory. Then notice my xmlns that I have in the snippets above? Adding that will give you IntelliSense on the file format.